A few months ago, Max Reid published an article at New York Magazine commenting that increasingly most of the Internet is fake. He starts with Twitter bots and fake news and winds up contemplating the inauthenticity of self. Fake traffic, automatically-generated content, and advertising fraud are not necessarily lethal. What *is* lethal is the constant nagging doubt about what you're seeing or, as Reid puts it, "the uncanny sense that what you encounter online is not 'real' but is also undeniably not 'fake', and indeed may be both at once, or in succession, as you turn it over in your head". It's good not to take everything you read at face value. But the loss of confidence can be poisonous. Navigating that is exhausting. And it's pervasive. Last weekend, a couple of friends began arguing about whether the epetition to revoke Article 50 was full of fraud. At the time, 40,000 to 50,000 people were signing per hour and the total had just passed 4 million. The petition is hosted on a government site, whose managers have transparently explained their handling of the twin challenges of scale and combating fraud. JJ Patrick's independent analysis concurs: very little bot participation. Even Theresa May defended its validity during Wednesday's Parliamentary debate, even though her government went on to reject it. Doubt is very easily spread, sometimes correctly. One of the most alarming things about the Boeing 737 MAX 8 crashes is the discovery that the Federal Aviation Administration is allowing the company to self-certify the safety of its planes. Even if the risk there is only perception, it's incredibly dangerous for an industry that has displayed enormous intelligence in cooperating to make air travel safe. Another example: last year Nextdoor, a San Francisco-based neighborhood-focused social networking service, sent postcards inviting my area to join Think of it as a corporately-owned chain of community bulletin boards. Across the tracks from me, one street gossips on a private community bulletin board one of them has set up, where I'm told they have animated discussions of their micro issues. By comparison, Nextdoor sounded synthetic; still, I signed up. Most postings ask for or recommend window cleaners and piano tuners, buildes and babysitters. Yet the site's daily email persistently gives crime and safety the top spot: two guys on a moped peering into car windows reacted aggressively to challenges; car broken into at Tesco; stolen bike; knife attack; police notices. I can't tell if this is how the site promotes "engagement" or whether its origin is deliberate strategy or algorithmic accident. But I do note the rising anxiety among people's responses, and while crime is rising in the UK, likely attributable to police cuts, my neighborhood remains a safer place than Nextdoor suggests...I think. What is certain is that I doubt my neighbors more; you can easily imagine facing their hostile inquisition for being a perfectly innocent hoodie-wearing young male on a moped using a flashlight to look for dropped keys. Years ago, some of us skeptics considered mounting a hoax - a fake UFO to be found in someone's garden, for example - to chart its progress through the ranks of believers and the media. In the end, we decided it was a bad idea, because such things never die, and then you have to spend the rest of your life debunking them. There are plenty of examples; David Langford's UFO hoax, published as an account found in his attic and written by William Robert Loosley still circulates as true, goosed since then by a mention in a best-selling book by Whitley Strieber. As the Internet now proves every day, once a false story is embedded, you can never fully dig it out again. Worse, even when you don't believe it, repeated encounters can provoke doubt despite yourself. Andrew Wakefield is a fine case in point. Years after the British Medical Journal retracted his paper and called it a hoax, the damage continues to escalate. Recently, the World Health Organization called vaccine hesitancy is a top-ten threat to health worldwide. Hesitancy is right. I am an oddity in having been born in 1954 but having somehow escaped all the childhood diseases. "You probably just don't remember you had them," the nurse said when I inquired about getting the MMR, now that every week you read of a measles outbreak somewhere. True, I *don't* remember having them. But I *do* remember, clearly, my mother asking me, "Were you *close* to them?" every time the note came home from school that another kid had one of them. We made an appointment for the shot. I then realized that years of exposure to anti-vaccination arguments have had their effect. Hundreds of millions of people have had these vaccines with little to no ill-effects, and yet: what if? How stupid would I feel if I broke my own health? "It's just fear of illness," someone carped on Twitter, trying to convince me that vaccines were not safety-tested and only a fool would get one. Well, yes, and some illnesses *should* be feared, particularly as you age. "I know," the nurse said, when I commented that spreading doubt has been a terrible effect of all this. She pushed the plunger. Two days later, a friend living in north London emailed: she has mumps. It feels like I had a close call. 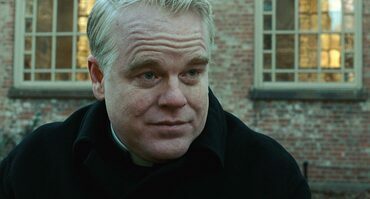 Illustrations: Philip Seymour Hoffman in John Patrick Shanley's DOUBT.